This week MMMM is going to give readers some consumer advice regarding Romando figures. 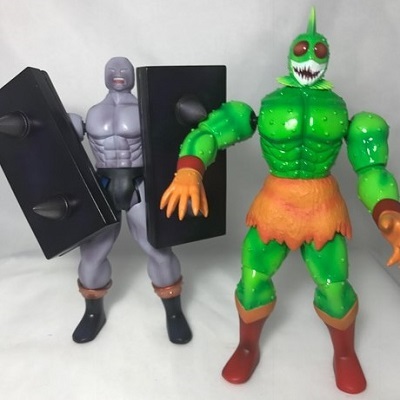 The common thought is that the majority of Romando figures are made poorly and I’m sure this prevailing thought has probably stopped M.U.S.C.L.E. collectors in the past purchasing a Romando figure for the fear of the unknown. What if I get a really poor figure? The disappointment in that scenario can be very real. 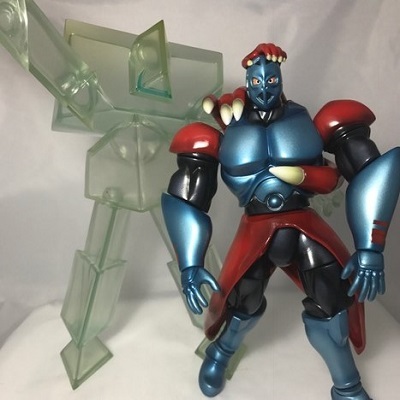 There are actually some Romando figures that are exceptionally well made. 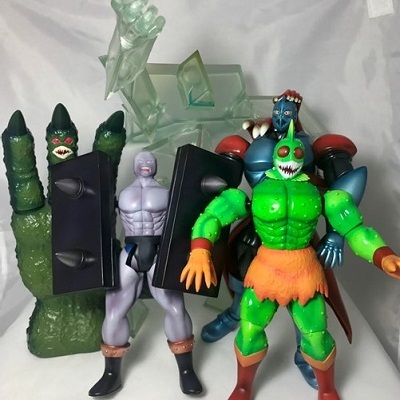 The 1st figure is the transparent Prismman figure and he’s probably the worst. What makes him absolutely horrible is that fact that every time you pick it up, the figure breaks into 2 pieces as the plug that holds the top half to the bottom half is so flexible that it doesn’t hold. I’ve been tempted to glue it but I’m certain that wouldn’t even hold it together. The articulation is also terrible. I have to pose 1 arm well above his head to counter balance the horrible leg positioning. It looks very unnatural. He is supposed to resemble a block of ice but in reality it has a green tinge that doesn’t look all that good. If you want a Prismman, there are a choice of teal or blue that is different to this one and larger. Okay, this figures is all that bad as he comes with a couple of nice accessories that I don’t have. Why he makes this list is the horribly bad leg pieces he has. It looks like he has 2 right legs as 1 leg is constantly pointed the wrong way, useless trying to stand him up without him looking like a super deformed figure and he has loose arms. He also has a shocking hip joint. I only bought this recently as I’ve wanted a Junkman Romando for a while. Boy, was I disappointed in this one. His crushers are so heavy compared to the rest of the figure that it’s impossible to stand him up, even when leaning him all the way backwards. The plastic on the rest of his body is so light that there is just no way the balance works. He also suffers from a symptom that many Romando face and that is the arm joints are so cheaply made that the ball joint sits the actual arm away from the shoulder so far that it looks like it’s detached. This figure is typical of the Romando fault I just mentioned above that I call shoulder seperation. I just chose Atlantis as the example figure but in fact there are numerous figures that have this quality. It’s my biggest pet peeve when it comes to Romando figures. It just looks ordinary having the arms floating on their own like that. Otherwise that Atlantis isn’t all that bad, it just isn’t all that good. This figure, if you can call it that, comes as an extra figure with the Sneagator figure. So I guess that’s a bonus. However, for a figure that is wildly popular with M.U.S.C.L.E. collectors, this attempt is terrible. It’s a hollow hand that a small child could fit their hand inside as it has no bottom. It also has no articulation in the fingers apart from the tiniest wiggle at the base of each finger. I do mean tiny, a couple of millimetres at most. So much more could have been done with this sculpt, at least some bending at the knuckles would have been nice! Mixer Titan – cheap nasty plastic blender glass and loose arms. Translucent green Ashuraman – the 3 arms on each side swing on 1 ball joint which isn’t ideal. Hope this was helpful – see you next week. This entry was posted on Monday, February 20th, 2017 and is filed under UofM News. You can follow any responses to this entry through RSS 2.0. You can skip to the end and leave a response. Pinging is currently not allowed. Romando definitely has some duds. Mixer Taite takes the cake for me as a figure that I wanted to love but was made with such poor materials that I despise him. I had visions of placing other figures in his mixer but learned the hard way that taking off his lid is a MISTAKE and that the plastic of the “glass” is very fragile. I’ve love to see a follow-up post on your favorite Romando figures, though. 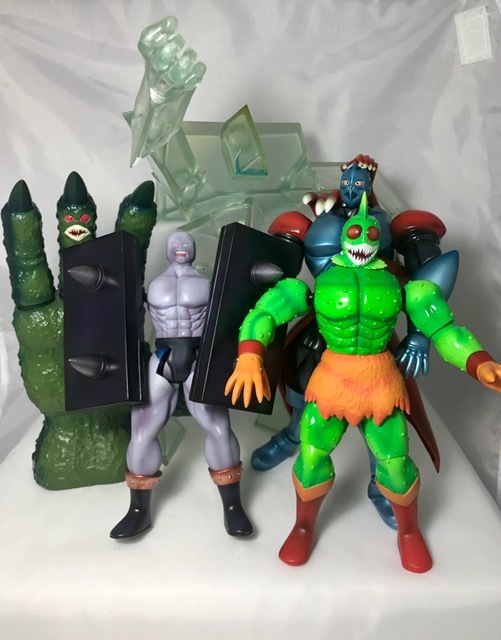 Off the top of my head, the EX-series Buffaloman and Kinnikuman, King the 100-Ton and Parthenon (the taller version) are all great figures. They’re never going to match the current SH Figuarts toys in poseability, but make up for it in character and size, in my opinion.